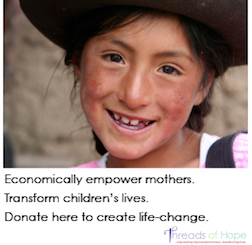 SEED Charities/Threads of Hope works to end the cycle of poverty & empower needy women & disabled adults. We aid disadvantaged, indigenous artisans through handcraft sales, grants for education, healthcare, housing, & microloans for business development. Isabel dreamt of a better life for her sons and daughter. After her husband left, it was easy to see how one might lose hope for that dream while trying to raise the children, by herself, in a shantytown outside of Lima, Peru. Opportunity seemed impossible to find in those poor, dry, dusty hills. With motherly determination and hope for tomorrow, Isabel persisted. In 2003 she learned of Threads of Hope, which empowered women through their handicrafts, to break out of the cycle of poverty. Isabel joined ToH and began to sew her family out of poverty. Each month she put money aside for her children's education as she knew knowledge was vital to their ongoing transformation. Isabel slowly began to build a secure home on the top level of her parents home. The little boys grew to teens and studied on the computer she purchased for their education. Her daughter began school and followed in her brother's footsteps of academic success. In 2017, Isabel home construction was complete, including a study area for the children. Isabel would tell you that Threads of Hope gave her hope and dignity. She became a leader in the group and participated in financial literacy training and opened her first bank account. Her life example taught her children the value of hard work and perseverance. Today, her oldest son is preparing for college. Their house continues to receive the final tweaks that make it a home. But probably best of all is the joy that is evident when you enter their life. Isabel and her children have been transformed by opportunity and hope for tomorrow. Economic development does that, gives people dignity, opportunity, and hope, and from that, joy abounds. Economically Empower Women - Transform Lives. Economically empowered women use their resources to better the lives of their children, families, communities, and the world. Help us empower women by supporting our work. Transforming lives transforms the world and you can begin making that difference here. Start with one - together we will ripple out to the world. Visit our website. Pledge your support. Change the world.